Non-metric analysis of variance examines the difference in the central tendencies of more than two groups when the dependent variable is measured on an ordinal scale. One such procedure is the k-sample median test. As its name implies, this is an extension of the median test for two groups, which was considered in Chapter IS. The null hypothesis is that the medians of the k populations are equal. The test involves the computation of a common median over the k samples. Then a 2 X k table of cell counts based on cases above or below the common median is generated. A chi-square statistic is computed. The significance of the chi-square implies a rejection of the null hypothesis. A more powerful test is the Kruskal-Wallis one-way analysis of variance. This is an extension of the Mann-Whitney test This test also examines the difference in medians. The null hypothesis is the same as in the k-sample median test, but the testing procedure is different. All cases from the k groups are ordered in a single ranking. If the k populations are the same, the groups should be similar in terms of ranks within each group. The rank sum is calculated for each group. From these, the Kruskal-Wallis H statistic, which has a chi-square distribution, is computed. The Kruskal- Wallis test is more powerful than the k-sample median test because it uses the rank value of each case, not merely its location relative to the median. However, if there are a large number of tied rankings in the data, the k-sample median test may be a better choice. Non-metric analysis of variance is not popular in commercial marketing research. 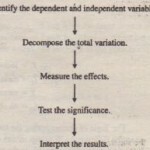 Another procedure, which is also only rarely used, is multivariate analysis of variance. As an example, suppose that four groups, each consisting of 100 randomly selected individuals, were exposed to four different commercials about Tide detergent. After seeing the commercial, each individual provided ratings on preference for Tide, preference for Procter & Gamble (the company marketing Tide), and preference for the commercial itself. Because these three preference variables are correlated, multivariate analysis of variance should be conducted to determine which commercial is the most effective (produced the highest preference across the three preference variables). The next example illustrates the application of ANOVA and MANOVA in international marketing research, and the example after that shows an application of these techniques in examining ethics in marketing research. As of 2009, mass media is continuing to focus more attention on the highly visible practices of unethical marketing research, and this poses a serious threat to marketing research practitioners. A study examined marketing professionals’ perceptions of the commonality of unethical marketing research practices on a cross-national basis. The sample of marketing professionals was drawn from Australia, Canada, Great Britain, and the United States. The major computer packages (SPSS and SAS) have programs for conducting analysis of variance and covariance available in the microcomputer and mainframe versions. In addition to the basic analysis that we have considered, these programs can also perform more complex – analysis. MlNITAB and EXCEL also offer some programs. Exhibit 16.1 contains a description of the relevant programs for MlNITAB and EXCEL. Refer to the user manuals for these packages for more information. We discuss the use of SPSS and SAS in detail. We have developed computerized demonstration movies that give step-by-step instructions for running all the SPSS and SAS Learning Edition programs, These demonstrations can be downloaded from the Web site for this book. The instructions for running these demonstrations are given in Exhibit 14.2. The step-by-step instructions for running the various SPSS and SAS Learning Edition programs discussed in this chapter are also illustrated in screen captures with appropriate notes. The following are the detailed steps for running a one-way ANOVA on the data of Table 16.2. 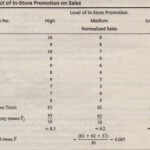 The null hypothesis is that there is no difference in mean normalized sales for the three levels of in-store promotion. 2. Click COMPARE MEANS and then ONE-WAY ANOVA. 3. Move “Sales [sales)” into the DEPENDENT LIST box. 4. Move “In-Store Promotion [promotion)” to the FACTOR box. We show the detailed steps for performing the analysis of co-variance given in Table 16.6. 2. Click GENERAL LINEAR MODEL and then UNIVARIATE. 3. Move “Sales [sales]” into the DEPENDENT VARIABLE box ..
4. Move “In-Store Promotion [promotion]” to the FIXED FACTOR(S) box. Then move”Coupon [coupon]” to the FIXED FACTOR(S) box. 5. Move “Clientel [clientel]” to the CO-VARIATE(S) box. For non-metric analysis of variance, including the k-sample median test and Kruskal-Wallis one-way analysis of variance, the program Non-parametric Tests should be used. The detailed steps for the other procedures are similar to those shown and are not given here due to space constraints. The instructions given here and in all the data analysis chapters (14 to 22) will work with the SAS Learning Edition as well as with the SAS Enterprise Guide. for a point-and-click approach for performing analysis of variance, use Analyze within SAS Learning Edition. The ANOVA task offers one-way analysis of variance, non-parametric one-way analysis of variance, and mixed and linear models. 1. Select ANALYZE from the SAS Learning Edition menu bar. 2. Click ANOVA and then One-Way ANOVA. 3. Move SALES to the dependent variable task role. 4. Move PROMOTION to the independent variable task role. 2. Click ANOVA and then Linear Models. 4. Move PROMOTION and COUPON to the quantitative variables task role. 5. Move CLIENTEL to the classification variable task role. 7. Select PROMOTION and COUPON and then click Main. 8. Select PROMOTION and COUPON and then click Cross. 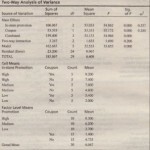 For non-metric analysis of variance. including the k-sample median lest and Kruskal- Wallis one way analysis of variance. the Non-parametric One-Way ANOVA task should be used. In the department store project. several independent variables were examined as categorical variables having more than two categories. For example. familiarity with the department stores considered was re-specified as high. medium. or low. The effects of these independent variables on metric dependent variables were examined using analysis of variance procedures. Several useful insights were obtained that guided subsequent data analysis and interpretation. For example. a three-category re-specification of familiarity produced results that were not significant.whereas treating familiarity as a binary variable (high or low) produced significant results. This. along with the frequency distribution, indicated that treating familiarity as having only two categories was most appropriate. 1. Run separate one way ANOVA`s to determine which recoded demographic variables explain the overall familiarity score.